This section shows latest compatibility table of PocketGeiger Type3 with Android devices, according to users' reports. Select earphone-mic after connecting the detector. The app is sometimes unstable. SC-02C (GALAXY S2) International ver. ※反転がONとなっている端末では、必ず設定画面からReverse Inputをチェックしてください。詳しくはマニュアルを参照してください。 / If `Revers' is ON, turn on Reverse Input in setting menu. For more information about it, check on-line manual. You can check if PocketGeiger Type3 support your Android device, using a checklist below. お使いのAndroid端末のOSバージョンが、2.2以上であることをご確認ください。 / Your Android OS is 2.2 or later. お使いのAndroid端末に、3.5mmステレオミニプラグ（４極）方式の「マイク入力」があることをご確認ください。 / Your Android device has 3.5mm stereo connector and microphone input in it. Androidアプリはこちらからダウンロードできます。お使いの端末で起動することを確認してください。 / Check if the App runs on your device or not. Your Android device is ready to use Type3 if above checklists are clear. Please determinate and report parameters on your Android device! You can determine parameters (threshold and reverse flag) for any Android device in the following way. Please report and share the parameter. You'll get one extra PocketGeiger Type3 for free, if you report parameters for three or more models which are unlisted. Please write down your post address. Set following provisional parameters on setting menu, according to on-line manual. 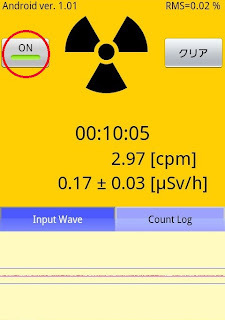 On the provisional parameters, thresholds for Radiation and Noise are very low (5%) to detect radiation pulse rapidly, and Trigger time is long (30sec) to observe the pulse wave. 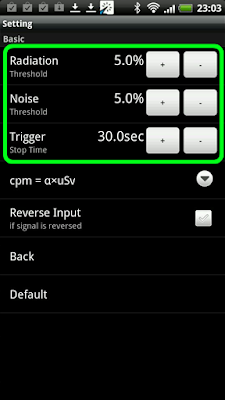 Back to main screen and touch InputWave button, and start measurement by touching ON/OFF button. If you have radioactive material, set it onto PocketGeiger to detect radiation pulse rapidly. The radiation pulse will appear one or couple of minutes later, as below. 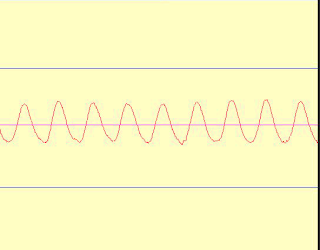 Check if the pulse has been reversed or not. 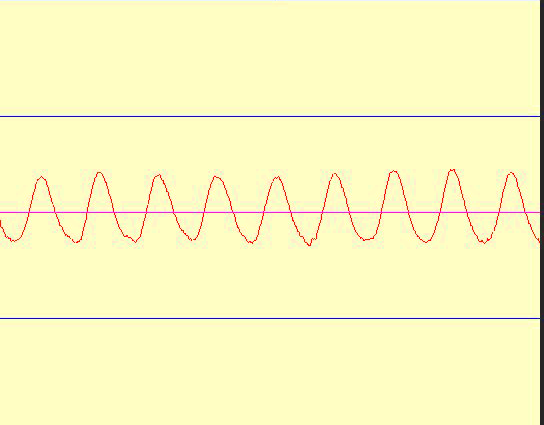 If reversed, you can see the wave profile as following. Then, back to <Step1> and turn on Reverse Input and try again. Touch Clear button to erase current, holding wave shape before measurement. Determine adequate threshold as shown in the figure below. 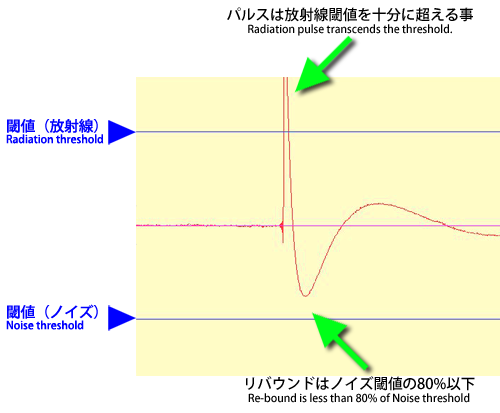 Back to <Step1> and reconfigure threshold and check radiation pulse until you find it. 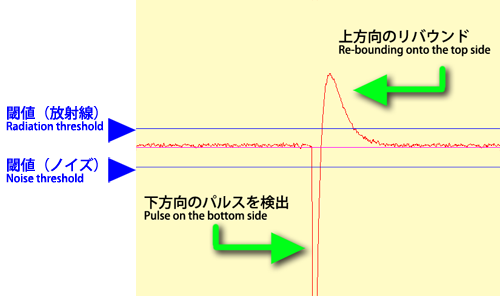 Remember touching Clear button to erase current, holding wave shape before measurement. 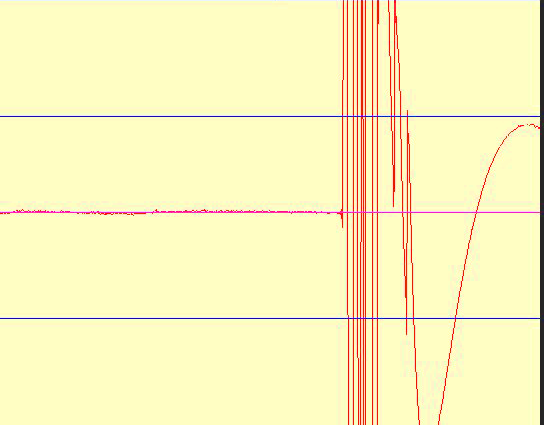 If your Android device has not detected a PocketGeiger, you can see your voice profile as below. Then restart the device or insert and remove a cable. 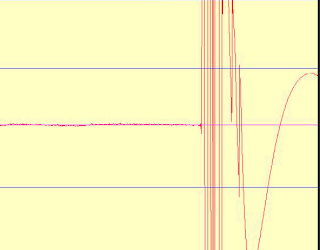 When vibration noise detected, you can see big wave profile as below. 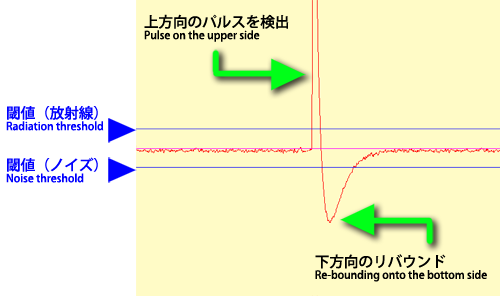 Then, touch Clear button to erase current, holding wave shape before measurement.